Ok, so Tim has put in my hands a Geneve that reproduces the problem with TIPI. I've built a test cartridge that exercises the TIPI in GPL/ROMPAGE mode, and a corresponding python script. What we see is that I cannot write to the 8 bit latches in the CPLD at 0x5FFD and 0x5FFF. This is all I know so far, all the rest of TIPI works... reading from the latches set by the PI work fine, reading the ROM works fine, the crubits work fine. For the next 30 days, this will be my HOBBY priority. and if I do not have a solution by then, I am done. The only interest I have in getting it to work on other peoples' Geneves is gaining a little bit of knowledge. I don't build TIPIs... I won't build TIPIs. So if the outcome requires physical changes, you'll all have to find someone to build them. So, if you want this to work, now is a good time for you to learn how to read verilog, and assembly, and pester me. Beery has been feeding me clues for a while... Given some of what he has fed me, and the lack of information out there, I'm going to start back at the prototyping process to figure out how to latch 8 bits in the DSR address space on write. Seems simple enough... But I have to pretend I don't know how to do it on a 4A or I'm trapped in the loop. If you think you figured it out at sometime within the 30 days and want a tester ping me. I have a Geneve and an extra TIPI PEB. Oh, if I think I have it fixed within the 30 days, I will publish the changes and instructions, and be done. I've tried to find clues in notes others have written over the years of things that are different. Whether any of them prove fruitful for Matt's debug work, only he can determine. I might have tossed this dart out there before - are you able to test latching 8 bits on an even address i.e. 5FFE or latch all 16 bits on an even address to see what is or is not latching? Neither a low byte or high byte write operation triggered the WE* (active low) signal. This is extremely astonishing. If this is business as usual on a Geneve, there is no wonder TIPI doesn't work. Interestingly, the input and output of the PIO port is controlled by CRU instead of WE*. Tomorrow night I'll have to go in with the logic probe. I wonder if the GenMod WE* signal was modified and thus why a GenMod/MEMEX system works? The MEMEX, as shipped, assumes that you may have a card in the P—Box which does not fully decode the address bus as defined by the original TI specs. Although the 99/4A only used a 16-bit address bus, TI set aside 3 additional lines (AMA, AMB, AMC) for future expansion. Some cards, such as the CorComp disk controller and the Horizon ramdisk do not currently decode these lines (easily corrected on both cards). Normally, placing a peripheral card on the bus without taking this into account could result in damage to the bus transceiver chips on cards which would simultaneously "answer" the bus. The MEMEX board takes care of this in two ways. First, if it detects another card answering the bus, it immediately (in a few nanoseconds) "disconnects" from the bus to prevent damage to itself or the other card. Second, a DIP switch (SW2, default=off) is provided to lock out those addresses (pages >82, >5E, >AE, >B2, >BA, >SA, >AA, >BA) which may not be decoded by such cards. The logic probe should confirm this easily enough. Using the LED to observe it, by mapping the LED to ~WE in the verilog is showing that the CPLD sees WE*.. I just had to turn off the lights in the room to be able to see it. This is good... The Geneve is not uber-crazy... only mega-crazy. It also appears that the CRU_CLK is combined with the MEMEN before it goes to the PEB bus, so it is not pulsing even though it starts as the same pin on the 9995 as WE. I've been able to get it too work by simplifying the code that controls the signal to the 74'245 bus chip on the TIPI board. It now allows data in to the CPLD whenever the TIPI crubit is enabled and the address is in the DSR space, regardless of if it is a memory operation. All I did was remove the && ~TI_MEMEN. Latching operations still require ~WE and fully decoded address. 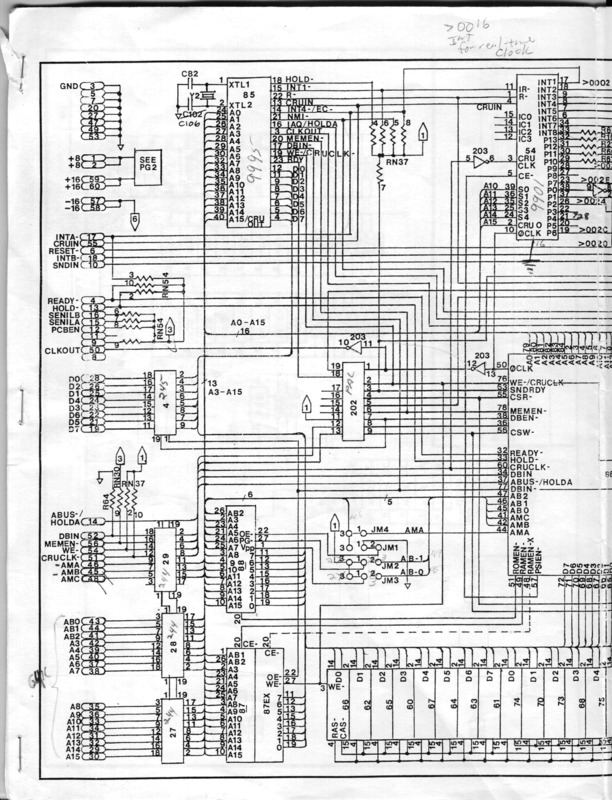 This should be ok, as the ROM chip is controlled for read operations from >4000 to >5FF8, and the direction is of the '245 is separately controlled considering DBIN. Code is on a branch in github... Requires reprogramming the CPLD. Sounds like great news. Will we as users be able to do this reprogramming (TI-99/4A software upgrade), or will it require sending the board back to you, etc.? Once I know I don't have to place exemption for side port or 4A or GENMOD usage, I will merge in the change and make the jedec file available. So that any new boards others are building can be at latest. If you have a Xilinx programming cable the software required is free. I use a knockoff / counterfeit cable. If you are not in the USA a programming cable should be cheaper than round trip shipping. I haven't sold any TIPI's to anyone for use on a Geneve. I have tried to be extremely clear contrary to some excited posts that it did not work. But there might be a couple of you with 9640s that want interchangeable PEB cards. At some point I'll declare a plan. Ok, I've reprogrammed my sideport TIPI, my 4A's TipiPEB and it all worked. Worked also with my GENMOD Geneve. So I've merged the CPLD code into the main codebase. And closed the github project issue. There is an entire internet out there on how to install and use it... I do this on an unsupported Ubuntu variant, which required some 3rd party usb-driver for the programming cable, usb permission modifications, and LD_PRELOAD command to glue things together... I cannot answer questions about how to set this up on Linux. I didn't take notes, and would just have to do the same research you can do. Windows should be much easier. Use Windows. TIPI DSR file features only works in ROMPAGE mode under GPL. The board can be accessed in MDOS if you are a programmer. Right now, there is no software that does this. See BeeryMiller's other threads. Anyway, TIPI seems to work, just don't hold any expectations that it is useful. Respond to this thread with a picture of your Geneve. I don't know how I want to handle this yet... But I'd like to know how many of you there are. ( If you don't have a Geneve, I won't do it, no need ) And how many boards need updating. the same holds true with the TI FDC & CorComp FDC with a standard Geneve. Which doesn't really make sense, since to boot from either card the Geneve must access the ROM and memory mapped addresses on the card. The Myarc cards, Horizon RAMdisks, the SCSI card, the IDE card, the MBP Clock card, the SIDblaster, and a few other cards all operate fine under rompage mode (which just places the external bus into memory in place of the Geneve's software DSR). the TI/CC cards use VDP whereas the others do not; I can't see that as the culprit but who knows. I am home alone this weekend and have my PEB set to do some repair work. I'll toss the cards into the PEB to look around. The TIPI fix does open up a few possibilities. Well done. If you have the capability and still have the older CPLD code base, or perhaps even with the current code base, can you check something? No problems on the GPL/Rompage side of things. On the MDOS side of things I have seen two things with my TIPI card. It could very well be something I am not considering, but I think some of my debugging tests has ruled that out. I can open a socket and connect to my BBS, I can close the socket, and I can write to the socket and can confirm I am sending output as expected because I can blindly type and login to my BBS. The recmsg routine is giving me problem as well as the status of the open socket. Both with the Open Socket command as well as the Read socket command, the only output I am getting is >33 when I do the read at instruction >4010 in the TIPI DSR. If you have some code, can you confirm you are getting what you would expect? Or, I can send you over my code? I usually call those routines with WP set to the 4A's GPLWS. >83E0, but I tried to write them so it didn't matter. 1. I was reading the GENMOD installation manual and noticed that it instructs you to cut pin 56 (MEMEN) from the path sourced by the big gate-array, and wire it up to the new GAL tacked onto the back of the board. This would explain a significant timing difference that was allowing me to include MEMEN in my equations for transitioning the '245 on TIPI. Moved message to other group. Posted in wrong topic area. Edited by BeeryMiller, Sat Mar 30, 2019 5:04 PM. I'll collect a group and meet matt to program. Return shipping i can take paypal or cards I'll use your box so tough to estimate but this is the top end. Please pm or email to lmk its on the way. I'm waiting for some feeedback from Matt on some code since I have a GenMod system. I may go ahead and place an order for another TIPI PEBox. Let me/us know when you have cards with the updates. As it looked like Matt got my code working on his system, I will be sending my TIPI out to you tomorrow unless he sees something different with the older CPLD code when he test things out. With your timetable, and trying to meet up with Matt, what kind of timeframe are you anticipating for a turn around. Just trying to get a feel, no pressure, etc. I'll have to send the TiPi I have spoken for my Geneve back for reprogramming. do we have the Geneve 1.00 BOOT BIOS source code?